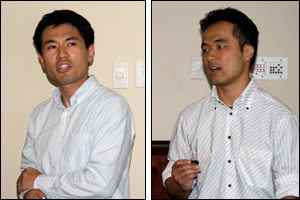 Two ISR visiting research scientists from Honda R&D co., Ltd., Japan, gave their final project seminars on July 21 and 23. Tetsuaki Nakano is a senior engineer in Honda R&D's research division of advanced power plant, and is engaged in research and development of electronic devices that are used for gasoline/diesel engines, controller design of engine and combustion. He spoke on "Hardware and Algorithm Development for Control of Bipedal Locomotion," a project he worked on with Professor P.S. Krishnaprasad (ECE/ISR) in the Intelligent Servosystems Laboratory. Nakano's research focused on the control of legged locomotion. He assembled the experimental setup with a commercially available humanoid robot platform connected to a Matlab/Simulink based controller. The main focus of the algorithm development was the procedure for designing virtual constraints for the legged robot with time-independent control that has a potential to improve the walking robustness against external disturbances. The virtual constraint design was based on Linear Inverted Pendulum mode that provides simple orbital energy calculation. Nakano also gave a brief introduction of the concept of energy based control. Kensuke Iwanaga is an engineer in Honda R&D's Automotive R&D Center. He spoke on "The Device Modeling and Characterization of 4H-SiC npn Power Bipolar Junction Transistor," a project he worked on with ISR-affiliated Professor Neil Goldsman (ECE). Iwanaga's research involved the 4H-SiC bipolar junction transistor (BJT), a fundamental device to satisfy the extremely higher power density requirements for new electric power circuits including inverters and DC/DC converters. The purpose of Iwanaga's research was to model and characterize the transistor Suppressed Surface Recombination structure (SSR)-BJT using a unique 4H-SiC device simulator, and then confirm the dynamic characteristics using device modeling. The static characteristics of the device data for forward current-voltages (I-V) match simulation data. In addition, other static characteristics were confirmed as well including: current gain, on-resistance, thermal dependence, and blocking voltage. After performing the analysis of the static characteristics, he plans to investigate and characterize the dynamic characteristics using the large size device modeling. Learn more about ISR's Visiting Scholars program, currently in its 10th year.